After a few travel snafaus, Trena, my mom and aunt all arrived safe and sound in Montreal. I, made a beeline for poutine! It tasted *just* as good as it did in high school — the one and only time I’ve been in Canada. Gravy, fries, cheese curds, ground beef. Too bad my body can’t digest you like it did when I was 18. Heartburn. Totally worth it though. 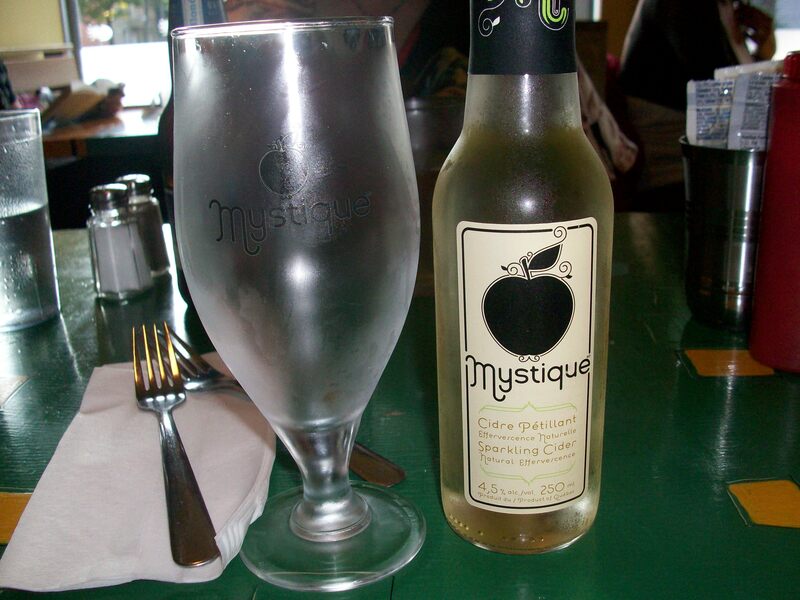 Perhaps the delicious, frothy and refreshing cider I discovered didn’t help. This, I would like to bring home. Including the adorable matching glass. So, I’m going to try and blog a little from Montreal! I bought a netbook last week because of this and several other trip. Much easier to do work from this instead of my Blackberry? You can’t be surprised that it’s pink, LOL! Tomorrow, bicycle tour of the city! That dish is what I call a joint food. It is by no means fine dining, but taste great. Honey, I am not even going to try to eat something like that because my doctor will yell at me, lol. Have a wonderful time in Montreal and great day of bike riding, and glad that you finally got out of Newark Airport as there is nothing more annoying than being stuck in an airport. Oh my, that looks yummy. My boyfriend The Carnivore would love it! Have a good time in Montreal! You maniac, with two pr weekends in one year! Have a great time! Oh I’m so glad that you are blogging from Montreal. Now at least I can feel a little like I’m experiencing the trip instead of just being jealous that I’m not there! Yes, delicious…but what are you wearing?! I am so jealous. I wish I could enjoy Poutine! The gravy in it sadly is not vegetarian. Love the pink netbook. See you soon! Dee! This one is 100 percent vegetarian gravy! I checked for Trena. That does look delish! See, now I want a netbook. So compact and cute, and the pink is awesome too! Meat in poutine? Onions? Where on earth were you eating this frankenfood?? Poutine has three ingredients: cheese curds, french fries and barbeque sauce. Period. The cheese curds must squeak when you bite into them, the sauce must be hot and peppery and the fries must be dark, crunchy and deeeeeeply fried. You were led astray, my child. Poutine Lafleur is the resto with classic poutine on the menu.3665 rue Wellington in Verdun. If you’re on the bike path along the river, it’s a short detour. Go, please. I hope you have a great time in our fair city – it’s funny to think you’re rolling around somewhere near where I am right now. We may even pass each other on the bike path without knowing it! LOL! Yes, I definitely went the non-traditional route! We went to La Banquiste (sp?). I plan to eat poutine every day :0 So, I’ll be sure try it with the BBQ sauce. She said something about a pepper sauce and I deferred. I wasn’t sure quite what it would be. 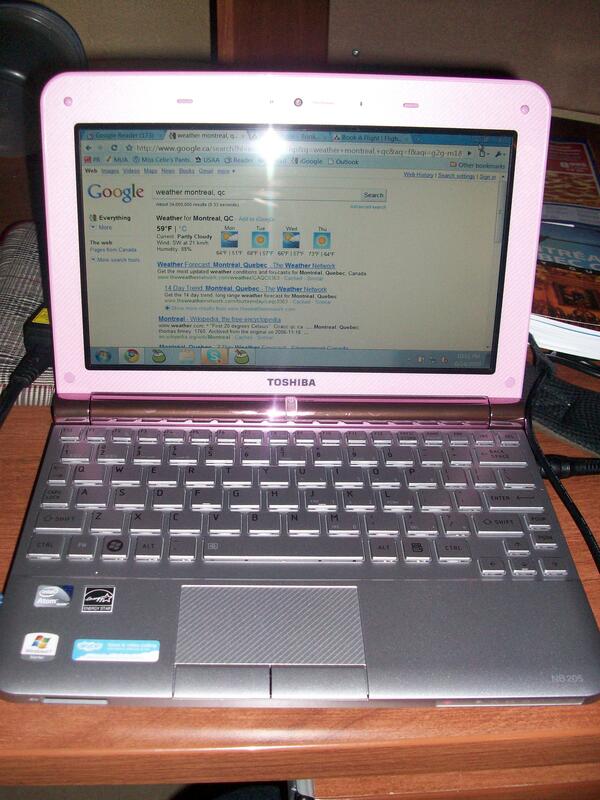 I just KNEW that netbook was gonna be pink before I got to the picture ! Man, I can’t wait to meet everyone on Friday ! Yes! Today was perfect weather for a ride. I only had my jacket on in the morning and it’s going to be fantastically warm this wknd. I’m saving the museum for tomorrow afternoon since it’s calling for a little rain. OMG my mouth literally started to water when I saw that photo! May have to make a trip north just for that!!! You need to take a look at what the French eat. You need red wine to help digest all those milk fats. I’m sure it’s a proven fact. Surely someone has done a PhD on the subject?? If not, perhaps someone should. I’m hoping to be in Toronto in August so I may have to test my own theory. I’m just looking at the pictures of your nails to the right and the second one from the top, the greyish colour is stunning on you. Yes! We are going to use them the rest of the week. I really really love it here! I lived in Quebec for 16 years and never ate poutine with ground beef where did you go? Don’t forget bagels and smoked meat. Two more musts. PS I’m making myself poutine for dinner tonight! Otherwise I’d be crazy jealous. We have poutine in Ottawa too. I have eaten it exactly once; that was the “trad” form without onions or other exotic ingredients – maybe I would like it better chez La Banquiste. See you Thursday in Mtl!